Sphynx cats. All I knew was that I had to have one! I immediately fell in love with this loving and amazing breed commonly known as the ‘hairless’ cat. The funds that come from the sale of our precious kittens help offset the costs of caring for them and ensure they are both happy and healthy. In the end, through all the hard work and dedication, I am content in knowing how much love our adoring kitties will share with you. We are a registered breeder and proud member of The International Cat Association (TICA) and regularly exhibit our cats in their shows. Want to see what we've been up to? Come check out our blog! Sphynx are an intelligent, inquisitive, extremely friendly breed that is unusually people-oriented. Sphynx commonly greet their owners (or any other person, for that matter) at the front door, with obvious excitement and happiness. Sphynx love attention, and it's a good thing because they draw it wherever they go. They are demanding of human attention and will do anything for a laugh. This makes them easy to handle by anyone, and because of it, they make excellent therapy animals. Sphynx are highly social cats. If you are gone during the day, they will enjoy having a friend in the form of another Sphynx, another cat or even a dog. They like the company and, equally important, someone to snuggle with so they can stay warm. They love being held and you can expect them to want to sleep with you, most likely under the covers. It is no wonder they were ranked as the most affectionate cat breed by the Journal of Veterinary Behavior in their November - December 2012 issue. There is yet so much more to tell you about this adorable breed. 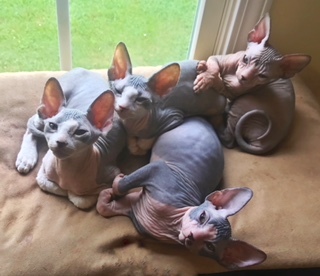 Check out our About Sphynx Cats page to learn about their physical characteristics, care and more; what you learn may just surprise you! Perhaps you've been dreaming about being loved by one of these special kitties and are ready to adopt. If so, jump over to our adoption process page to get started! Wondering when our kittens will be available? Want to receive our latest news straight to your email? Have other questions? Please reach out to me, I'd love to hear from you! 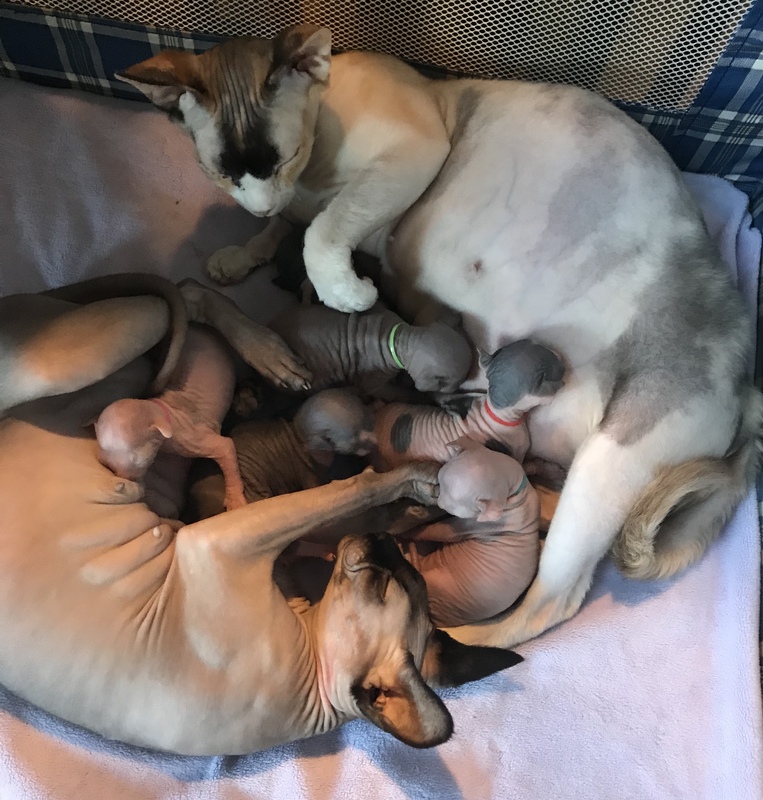 Annie's Sphynx is very excited to announce that we have two new litters of beautiful Sphynx Kittens!! WE ARE EXPECTING KITTENS THIS FALL!!! !